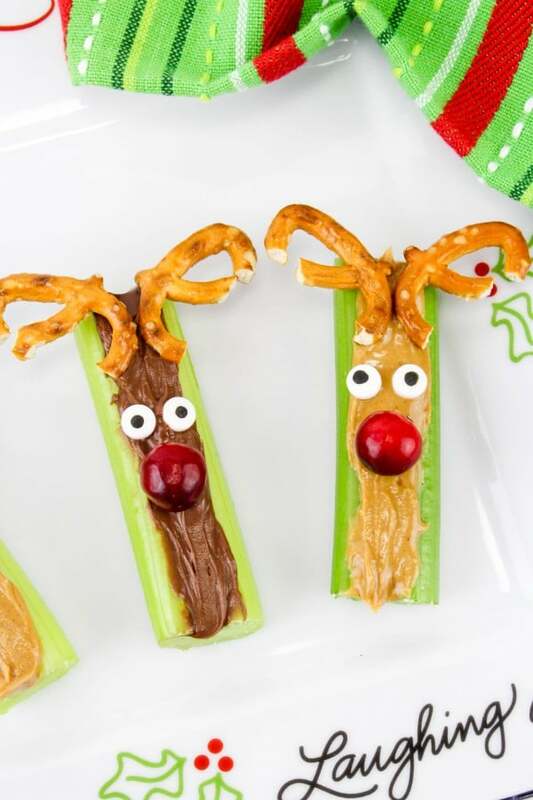 These Celery Reindeer Snacks are a fun and delicious twist on a familiar favorite. 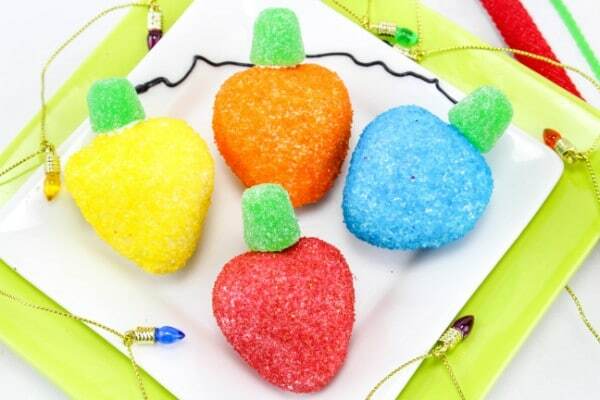 Easily turn a popular, kid-friendly snack into a festive treat with a few simple ingredients. 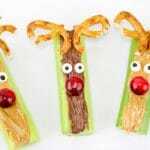 Kids don’t usually need help getting in the Christmas spirit, but seeing the joy these celery reindeer snacks bring to children might just brighten up any humbugs. These snacks are so easy to make. 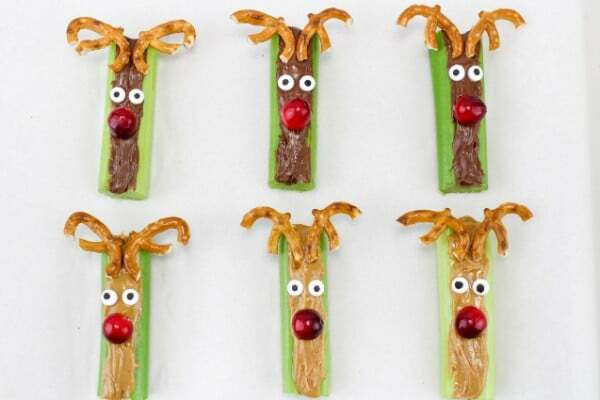 It only takes a minute or two longer to turn ordinary celery sticks into reindeer snacks. Chances are, you already have most of the items you’ll need for these snacks in your pantry already. If you don’t have (or want to use) fresh cranberries, you can use red M&Ms instead. Not planning to make up enough of these snacks to use the entire container of candy eyes? Don’t worry, these are fun to add to almost any snack for a pop of unexpected fun! 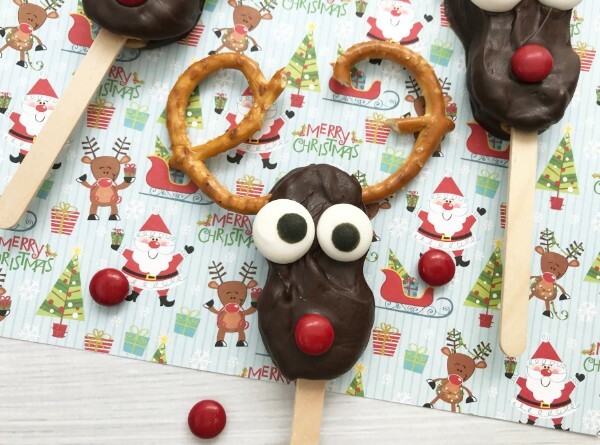 If you want to simplify this snack, you can opt to make just one type of reindeer. Instead of using both peanut butter and Nutella, you can just use one for all of the snacks. 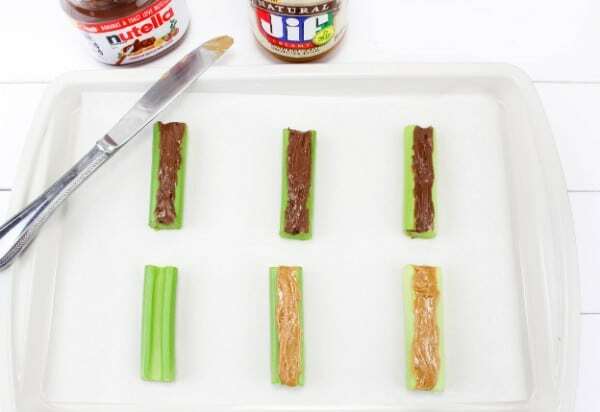 Cut celery into sticks that are 3-4 inches long. Spread peanut butter and Nutella along the center of the stalk. Break the pretzel twists in half. Arrange them at the top of the celery stick to form the antlers. Add two candy eyes below the antlers, then place a cranberry beneath each pair of eyes for the reindeer’s nose. That’s it! 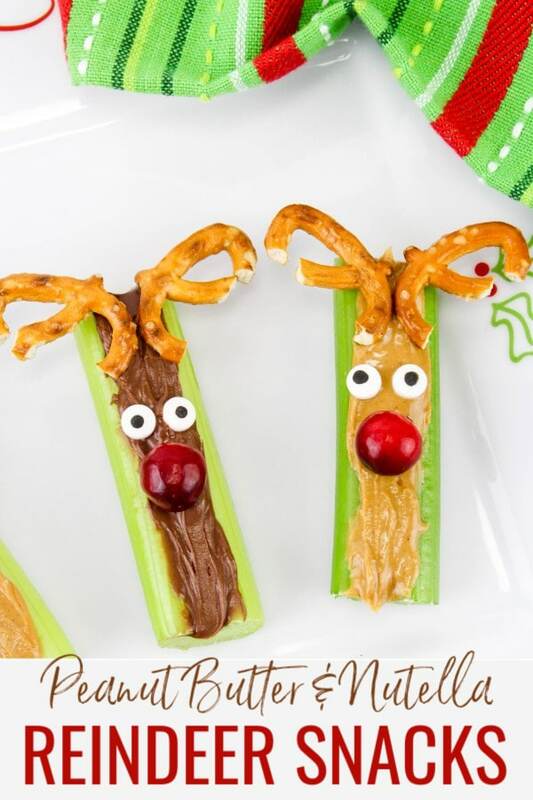 You have an entire herd of two different types of celery reindeer snacks! Cut celery stalks into 3-4 inch long pieces. Fill some with peanut butter and some with Nutella. Break pretzel twists in half and place them near the top of the celery to form the antlers. Then, add 2 candy eyes and a cranberry or candy for the nose. 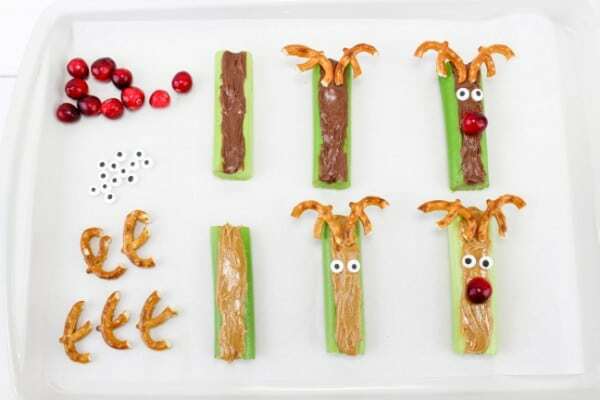 If you liked these peanut butter and Nutella celery reindeer snacks, you might enjoy some of these other fun Christmas treats. 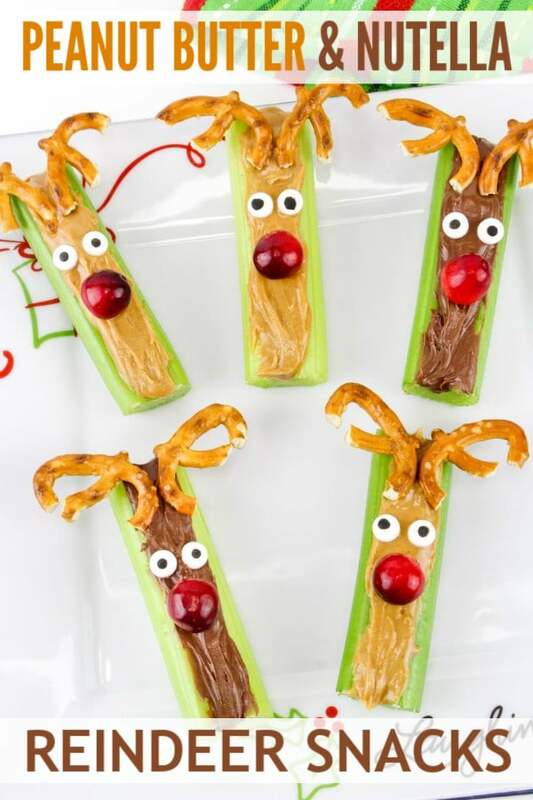 If you want to keep the reindeer them going, make up some of these adorable Nutter Butter Reindeer. And these Christmas Strawberries look like Christmas lights so they’re a tasty and fun way to dress up your holiday snack table. 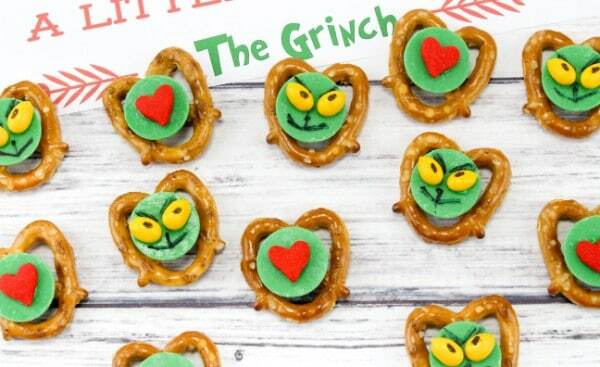 If you read or watch The Grinch Who Stole Christmas during the holiday season, make sure you have a batch of these Grinch Snacks on hand to munch on. They are so cute! I definitely have to try these snacks at home. These are awesome! I remember eating (and living) celery and peanut butter sticks as a kid. I never thought to add Nutella instead. What a great idea. These will be a great addition to our Christmas party. I love the idea of having a healthier addition to the treats table, especially such a cute one. Thanks so much for sharing! This is ADORABLE!!! Pinning to make for my family this Christmas! Those reindeer are just too cute! !